"These are easy to make for camping, my husband loves them! We prepare them at home and then leave them in the cooler until we are ready to cook. You can use any combination of meat and vegetables that you like. 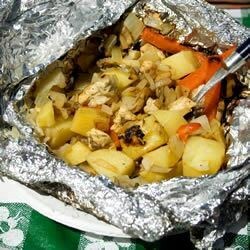 Do not try to use less olive oil or foil or your dinner will burn. Be careful when opening foil as steam will have formed inside and can burn you." We used frozen hashbrowns and they were great! We did as suggested and just left them in the cooler, it was a nice change from the usual camping food...thanks for sharing! !